Crisis Mapping can reveal insights on current crises as well as crises from decades ago. Take Dr. Jen Ziemke‘s dissertation research on crisis mapping the Angolan civil war, which revealed and explained patterns of violence against civilians. 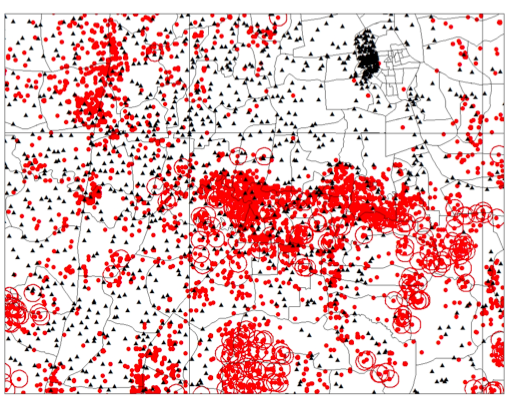 My colleague Dr. Taylor Owen recently shared with me his fascinating research, which comprises a spatio-historical analysis of the US bombardment of Cambodia. Like Jen’s research, Taylor’s clearly shows how crisis mapping can shed new light on important historical events. 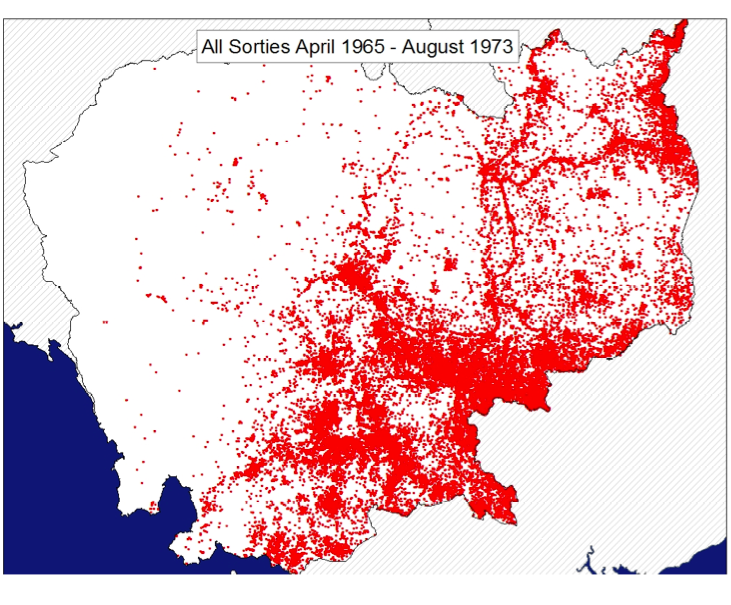 To be sure, the crisis mapping analysis of Cambodia “transforms our understan-ding of the scale of what happened to Cambodia during the Indochinese war. 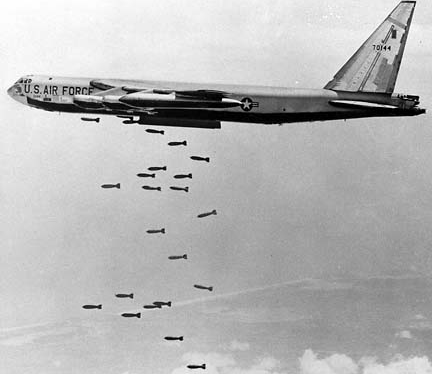 The total tonnage of bombs dropped on the country had previously been pegged at some 500,000 tons. The new analysis dramatically revises this figure upwards to “2,756,941 tons of US bombs dropped during no fewer than 230,516 sorties.” To put this figure into context, more bombs were dropped on Cambodia than the number of bombs that the US dropped during all of World War II. 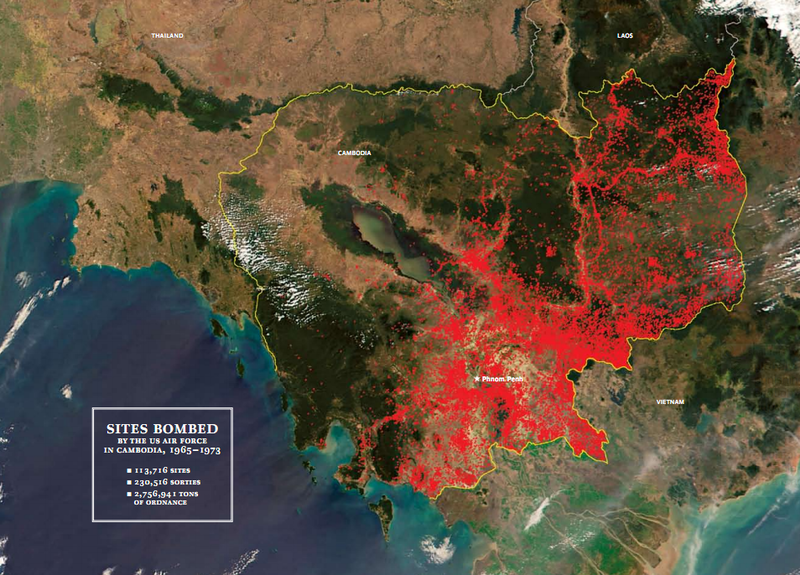 Cambodia remains the most heavily bombed country in the world. Kissinger had claimed that no bombs were being dropped on villages. He gave assurances, in writing, that no bombs would be dropped “closer than 1 km from villages, hamlets, houses, monuments, temples, pagodas or holy places.” As Owen reveals, “the absurdity of Kissinger’s claim is clearly demonstrated” by the crisis mapping analysis below in which the triangles represent village centers and the red points denote bombing targets, often hit with multiple sorties. This entry was posted in Crisis Mapping and tagged analysis, Bombing, Cambodia, Khmer, Rouge, US, war. Bookmark the permalink.